Motion City Soundtrack Release Movie and Screening! Alternative Rock band Motion City Soundtrack released a documentary called I Am The Movie: The Movie and it’s hitting the big screen. The band was sorting through hours of footage and photographs for their first album, I Am The Movie, and had so much fun and luck with what they found, they asked their friend Melissa Kraemer to take charge of the film and create the story of I Am The Movie. 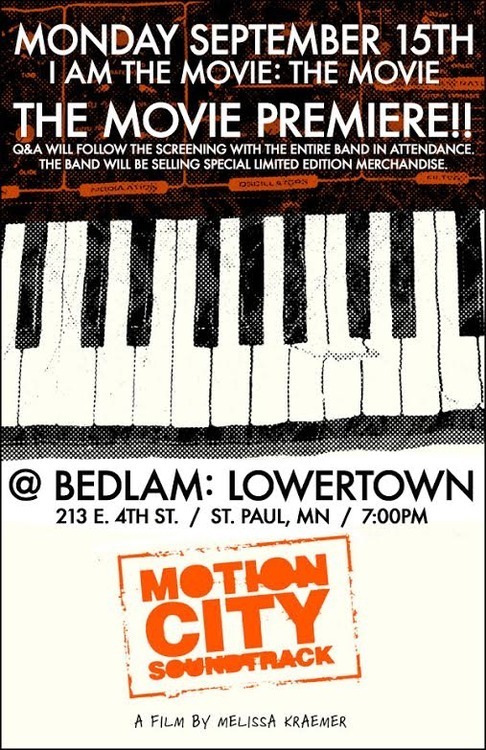 There will be a screening in Saint Paul, MN (hometown of the band) on September 15th at the Bedlam Lowertown. After the screening the band will do a Q&A with the audience and limited edition merchandise will be available for purchase. I have had the pleasure of going to a small Q&A with the band before and they are really down to earth and funny guys. Check out the film to see what they’re life is like on tour and backstage! Nashville “You’re Looking At Country” Episode with Star Studded Guest Apperances!